Chipolopolo célèbre leur victoire pour la première fois. Zambia coach Herve Renard says nobody should be surprised that his side topped their 2012 Africa Cup of Nations Group A.
Chipolopolo sealed top spot with a 1-0 success over co-hosts Equatorial Guinea on Sunday night, finishing the first stage with two wins and a draw. It means they will now play the second-placed team in Group B, which will be decided on Monday when Cote d'Ivoire take on Angola. A Southern African derby against the Angolans looks the most likely outcome. Renard expressed his surprise that nobody had given his side a chance of topping their pool, especially after they did just that in 2010, beating giants Cameroon to first place. "It wasn't a great match but the important thing was to get the points," Renard told reporters after Sunday's game. 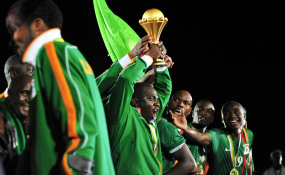 "The aim was to secure first place, as in 2010 when we finished in front of Cameroon. Here, we're ahead of the co-hosts, who were on cloud nine after beating Senegal.Now it's imperative we get to the semi-finals for the first time since 1996." The French coach would have been delighted with the clean sheet his side managed against Equatorial Guinea, who now have the prospect of a meeting with Cote d'Ivoire in the quarter-finals. "I'm disappointed because this loss has a bearing on the rest of the competition. But we are still not certain we'll be facing Côte d'Ivoire," their Brazilian coach, Gilson Paulo, said. 'It's only one defeat. We have to correct the mistakes for the next match and see the future optimistically." Paulo will be disappointed that the momentum his side had built up with consecutive wins over Libya and Senegal was broken, but they have already exceeded expectations by reaching the knockout stages. Anything they manage after this will be a bonus, both in terms of achievement and financially for the players.